After a nice sunny day for good Friday, it was back to cold, misty weather for Saturday as I caught the number 37 bus from the Market Square in Petersfield for the eight-minute journey back to the Queen Elizabeth Country Park. 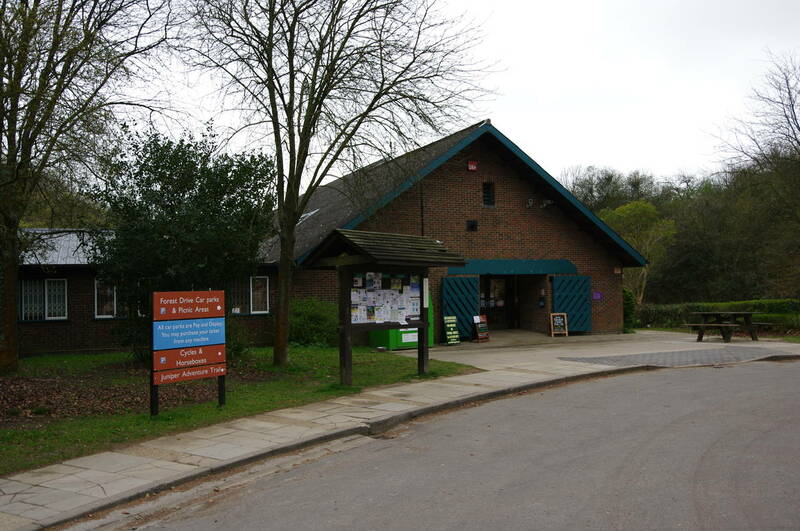 I rejoined the South Downs Way by the Visitor Centre (picture 1), where a large fingerpost (picture 2) points the way past the Visitor Centre carpark and under the busy A3 road. 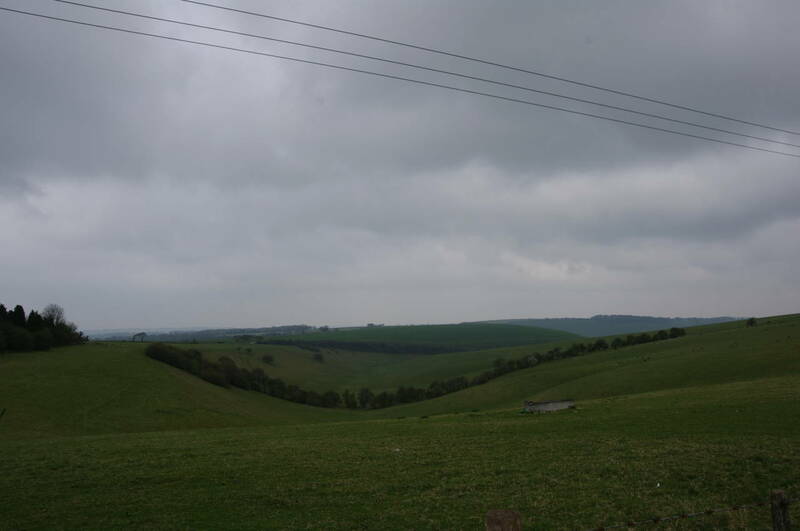 The route then heads out through a wooden gate and into a large pasture, soon beginning to climb northwards up the steep grassy slope of Butser Hill in the direction of a tall radio mast (picture 3). Turning around at another wooden gate about 800 metres up the hill, there were views back along the course of the A3, which cuts the Queen Elizabaeth Country Park in two (picture 4). Once through the gate, the path gradually curves around to pass well to the left of the radio station atop Butser Hill. 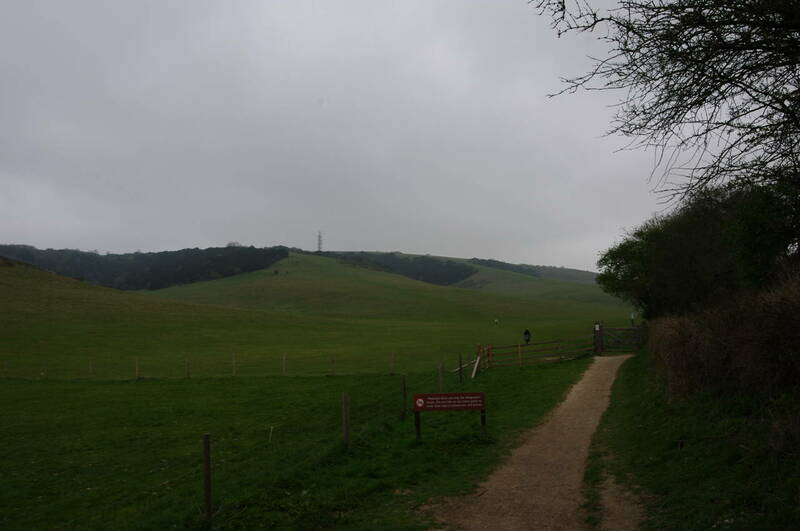 The radio station occupies the highest point on the entire South Downs, at 270 metres above sea-level, but the South Downs Way only climbs to 245 metres as it ascends through a grassy area dotted with bushes. 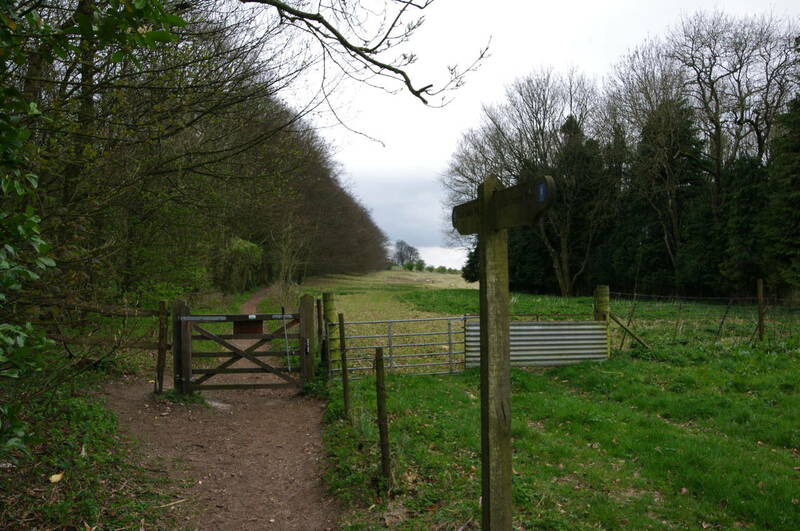 Through another couple of gates, the path joins Limekiln Lane and follows it southwest beside pastures, part of the path running parallel to the lane (picture 5). 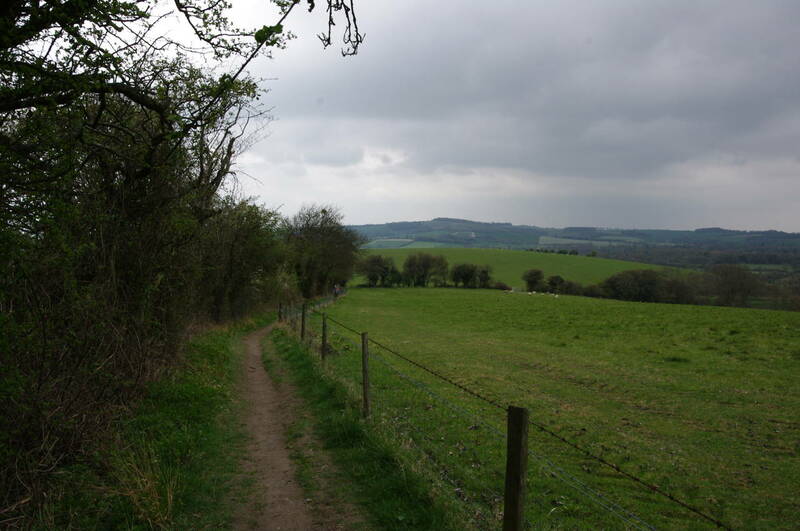 Reaching an intersection, the route turns right and follows a farm track westwards for a little over two kilometres beside the fields of Tegdown Hill (picture 6) and then through the slightly eerie woods of Hyden Hill (picture 7). 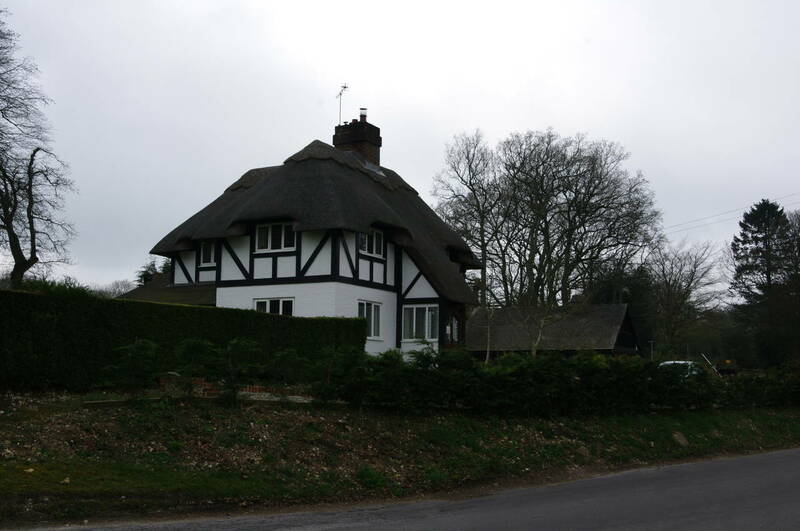 Eventually the track joins a lane at an intersection known as Hyden Cross, passing the thatched cottage of White Lodge (picture 8), before crossing another intersection and joining a fenced footpath that is separated from the road by a band of trees. Rejoining Droxford Road, the route passes opposite the site of the former naval base, HMS Mercury. The base was opened in 1941 and housed the Royal Navy Signals School until the base closed in 1993. The site is empty now, the buildings apparently having been removed quite recently as they still appear on Google's satelite images at the time of writing. All that is left now is the high razorwire fence around the site. Along the road I passed by the entrance of the Sustainability Centre and then the tree-shrouded Wetherdown Hostel. 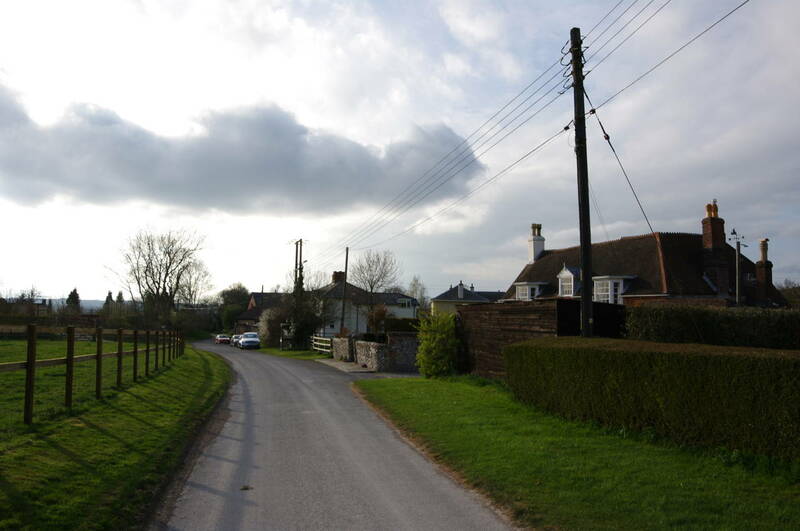 Just past the hostel, the Way turns north along a track that passes a couple of houses before the view opens out with Wether Down rising to the right and a grassy combe to the left (picture 9). 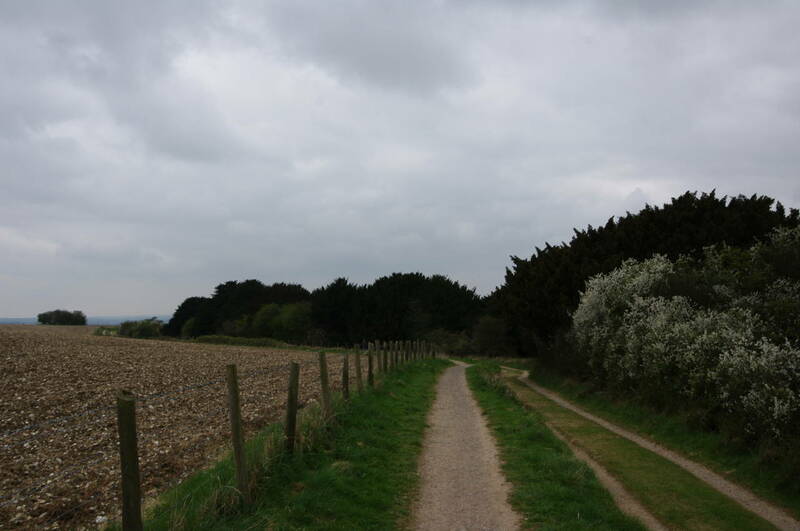 After passing Wetherdown Farm, where there are a couple of radio masts, the track becomes a narrow footpath beside a line of trees running across Salt Hill (picture 10). The path soon begins a long, gentle descent, passing through the small hamlet of Coombe Cross after about a kilometre and continuing ahead for another kilometre to reach a four-way intersection of paths. At this intersection the Way turns West and climbs over Henwood Down on a track between fields. Heading down the other side of Henwood Down, there was a good view across the valley towards the long clump of beech trees on top of Old Winchester Hill (picture 11), which I would soon be climbing. 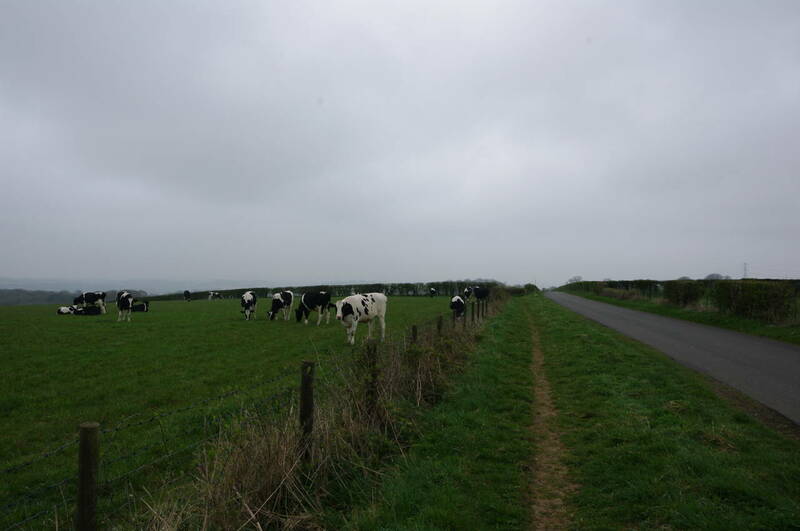 Reaching the valley floor, the route turns right along a lane where cattle were grazing in fields on either side. 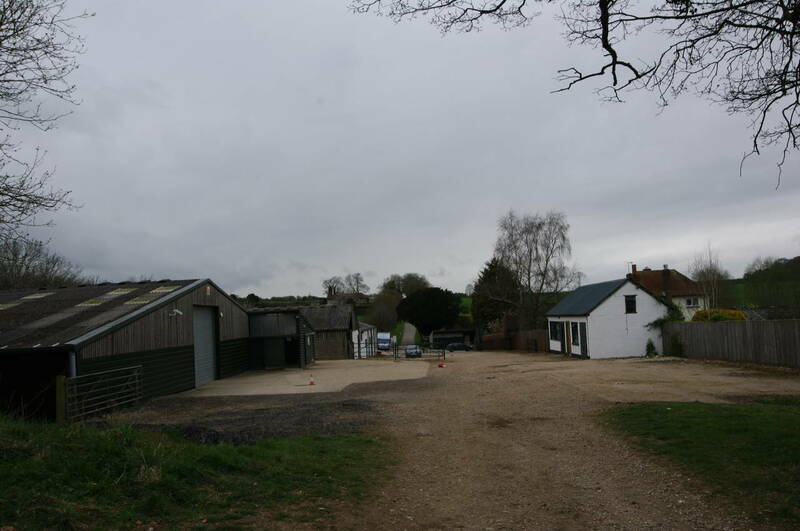 The lane soon reaches the carpark of the Meon Springs Fly Fishery, turning left towards Whitewool Farm (picture 12). 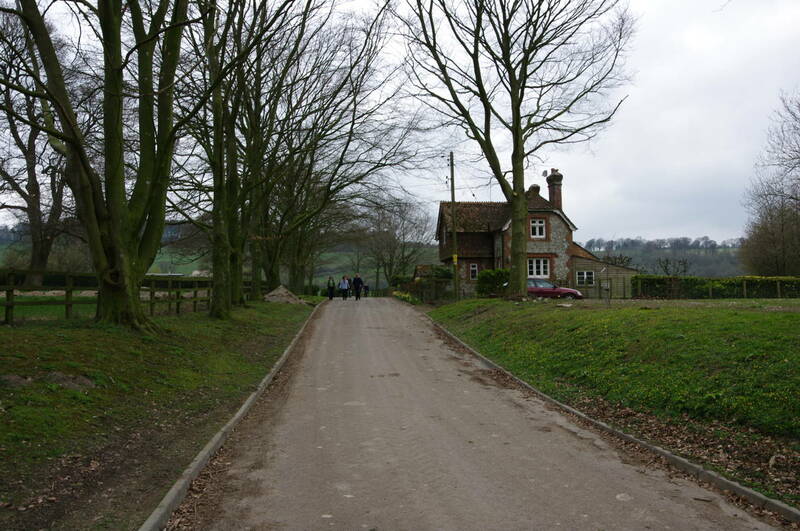 The lane curves left around some of the farm buildings before a signpost points back to the right along a farm track that heads for a small, disused chalk pit on the slopes of Old Winchester Hill (picture 13). Just before the pit, the Way turns right and climbs diagonally up the face of the hill for about 600 metres to reach a road that runs along the top of the hill. Here the Way turns almost 180 degrees to the left along a footpath that runs a little to the left of the road. 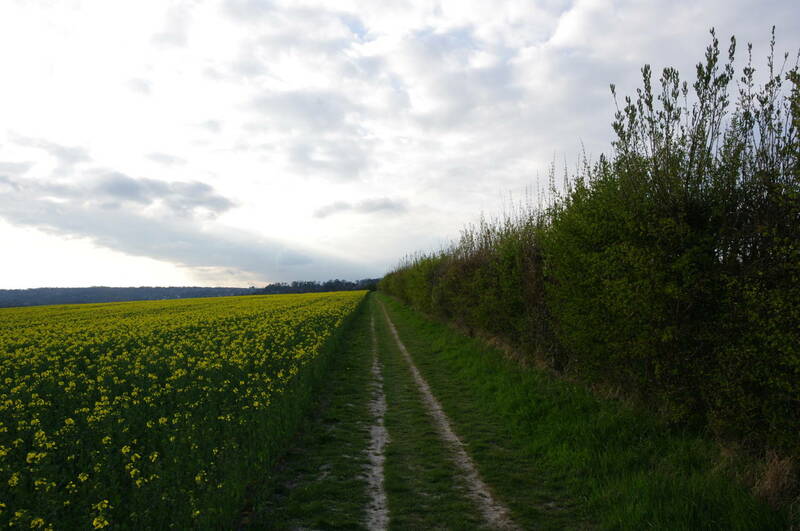 After a few hundred metres the footpath switches to the other side of the road, running along the edge of the Old Winchester Hill National Nature Reserve. 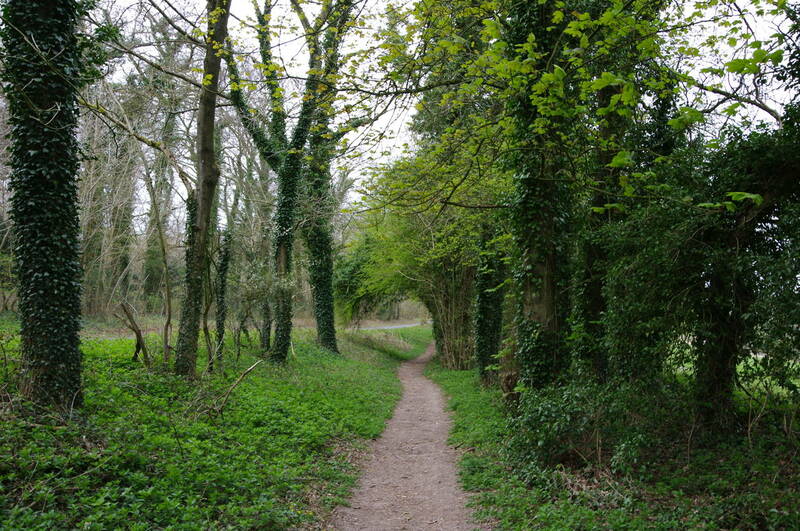 Beside a small carpark, the route bears right, joining a well-surfaced footpath with trees on the right and fields on the left (picture 14). 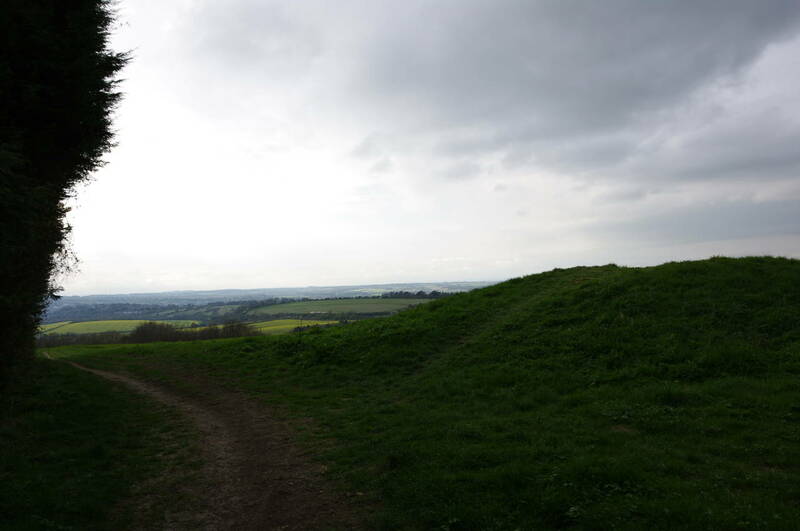 At the end of this path, the Way skirts around the edge of the earthworks of the Old Winchester Hill Iron-age Hillfort (picture 15) before beginning to descend gently into the Meon Valley (picture 16). 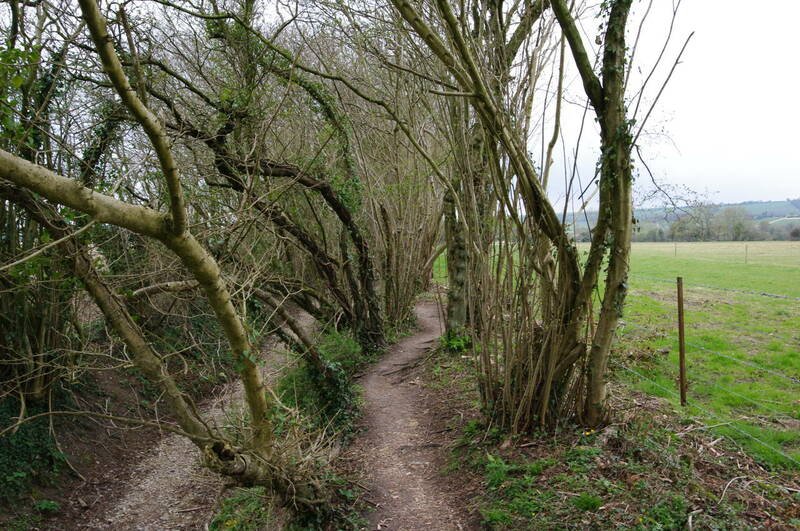 After a kilometre of following footpaths along field edges, the route enters a wooded area and climbs up some rough steps onto a disused railway embankment. 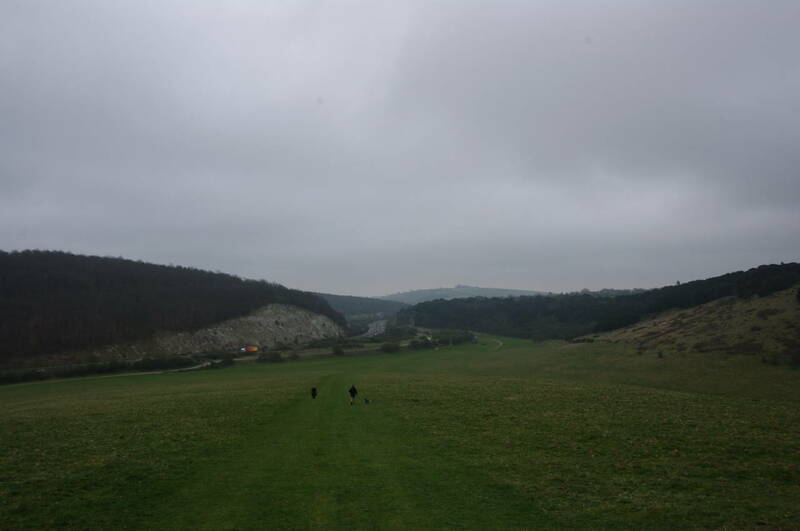 The South Downs Way splits here; horses and cyclists go southwest along the embankment, while walkers head west on a narrow footpath beside a dry stream (picture 17). Both of these routes are signposted as "temporary", though from what I've read, the route has been temporary since at least as far back as 1994! 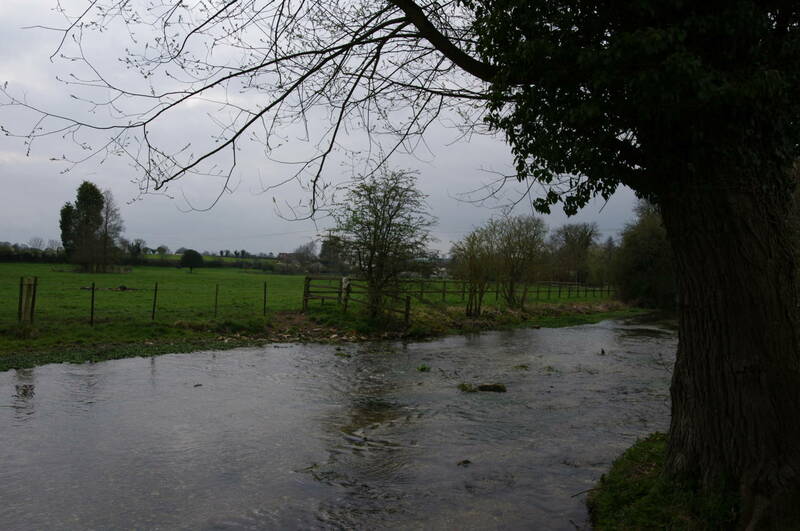 Reaching a farm track, the walkers' route bears right, towards a footbridge over the shallow but fast-flowing River Meon (picture 18). 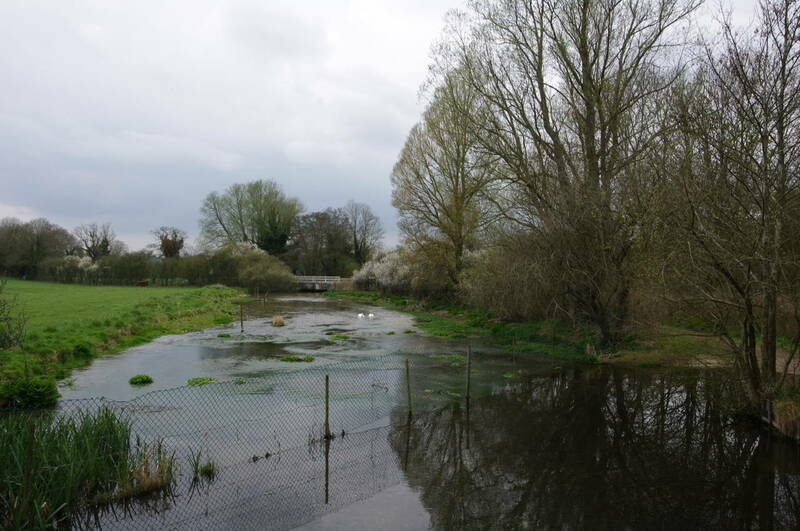 Crossing the bridge and following the river for a short distance downstream, the footpath reaches the busy A32 road. 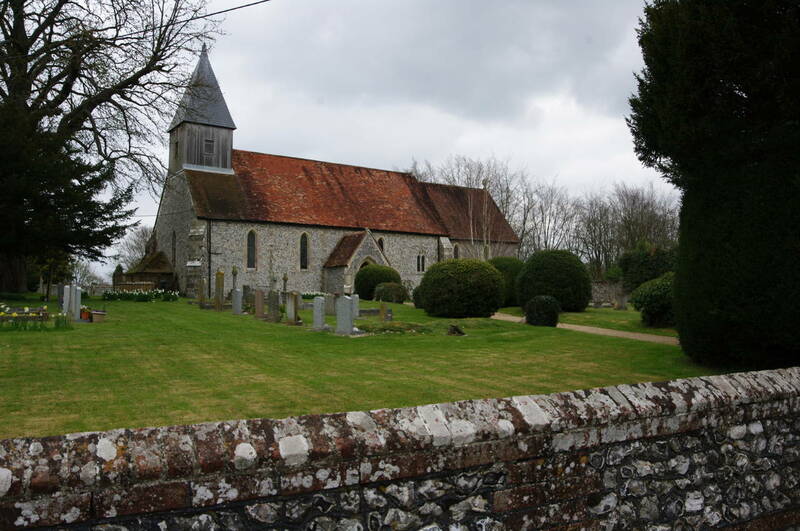 The Way crosses the road and continues straight ahead along Church Lane, which runs parallel to the River Meon (picture 19) and leads, after about 500 metres, to the village of Exton. 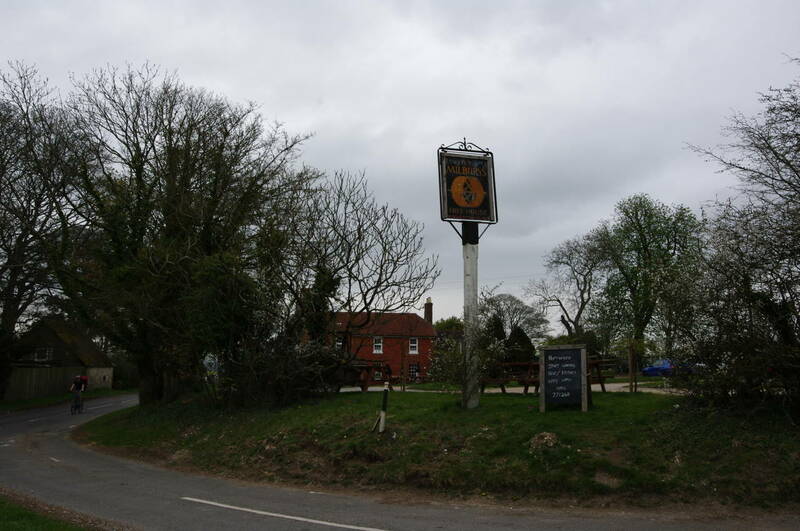 The South Downs Way goes straight ahead through the village, but at the first junction I headed left down Shoe Lane for a couple of minutes to reach the Shoe Inn pub (picture 20) a few minutes before one oclock, having already walked around seventeen kilometres since the start of the day. The pub was quite busy and I was lucky to grab a spot on the front terrace, where I enjoyed a pint of Wadworth's Henry's IPA while I waited for my order of beer-battered fish and chips. The pub also has a beer garden across the road on the bank of the river, and this too was very busy with staff carrying meals across the road every minute or two. 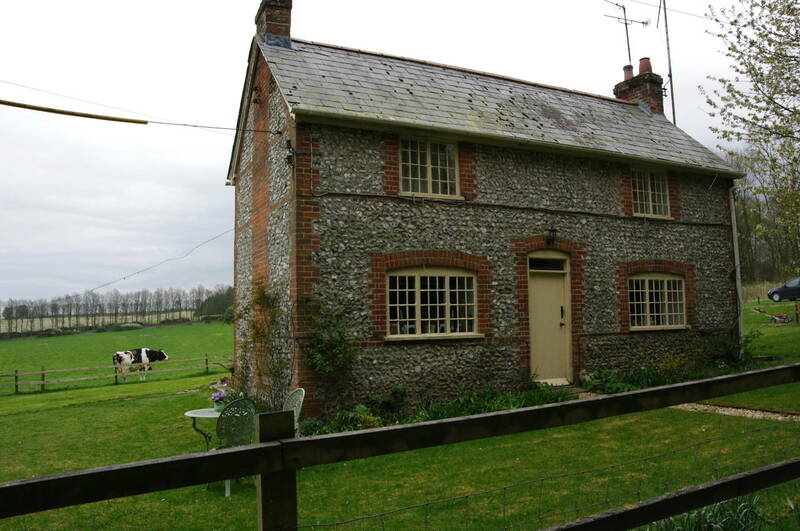 I was soon presented with an enormous piece of fish and a generous serving of home-made chips, which I was barely able to finish, but with another twenty kilometres to Winchester, the energy was definitely needed. Setting off from the busy pub, I returned to the junction of Shoe Lane and Church Lane, following the latter past the church of St Peter and St Paul (picture 21). A short distance further along the lane, the Way turns along a track that heads out of the village and out across a series of fields and pastures, separated by new-looking stiles. 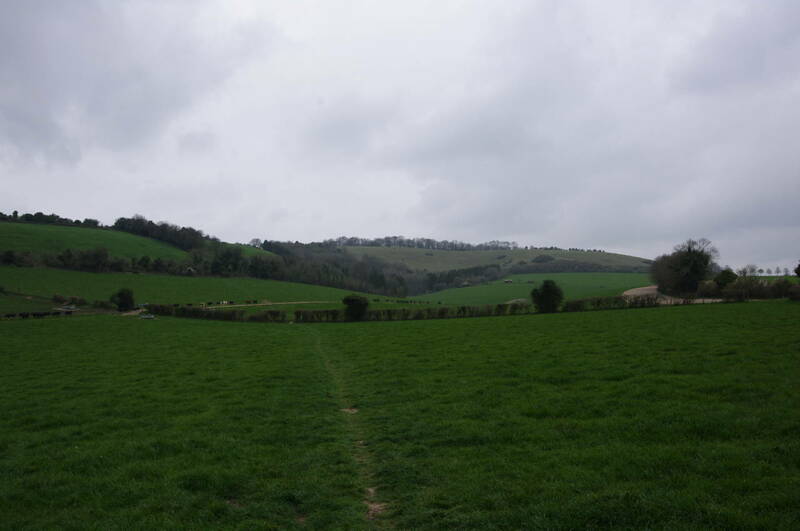 After initially going downhill in the first field, the path soon begins to rise up the slopes of Beacon Hill (picture 22), getting quite steep (picture 23) as it nears the road that brings the equestrian and cyclist route of the South Downs Way up from Exton. 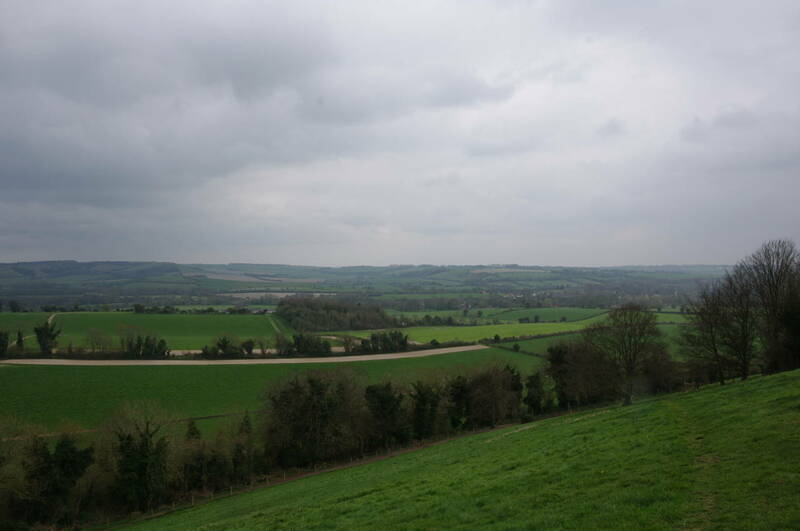 From the gate by the road there are good views back across the Meon Valley to Exton and beyond (picture 24). 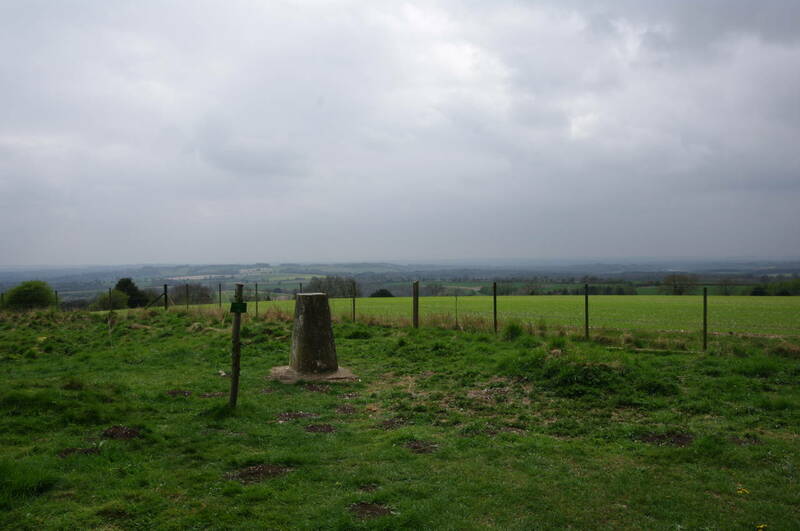 Only ten metres along the road a signpost points along a worn path that climbs northwards beside a field and leads up to the trig point at the highest point of Beacon Hill (picture 25). 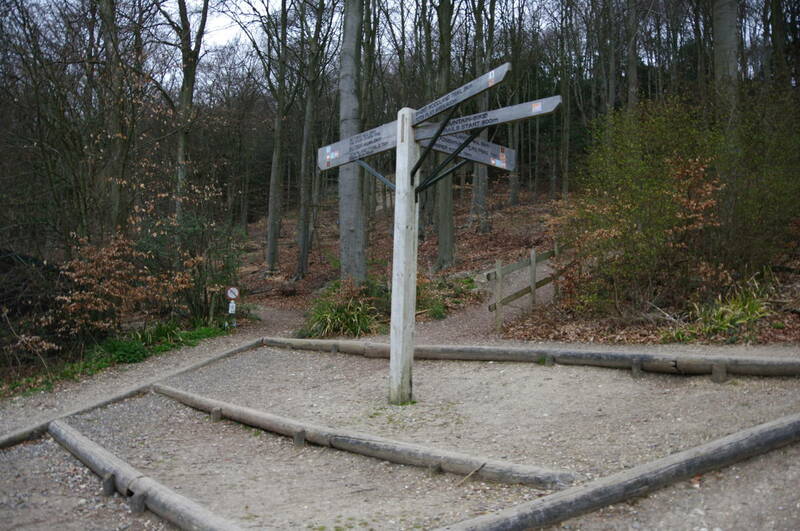 The route, no longer temporary, swings around to the west on a rough vehicle track beside the woods of Beaconhill Beeches. 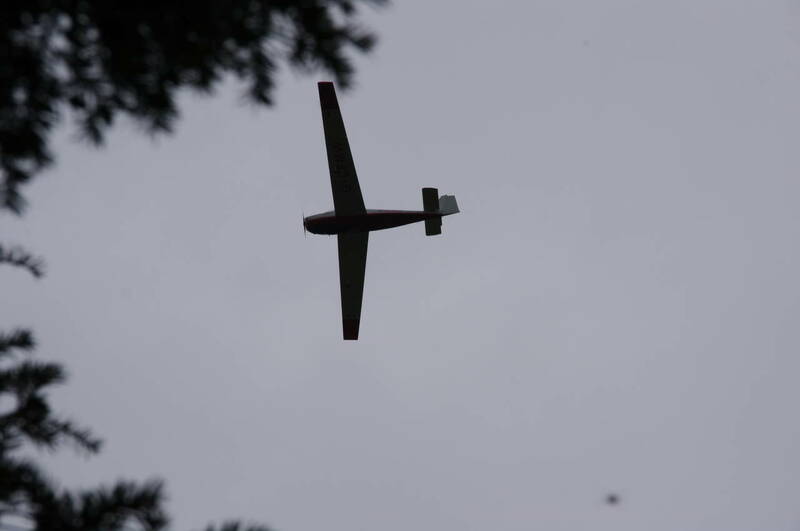 While I walked along the track a low-flying aircraft passed overhead (picture 26). The route soon rejoins the road by a carpark where a very large horse float was parked. 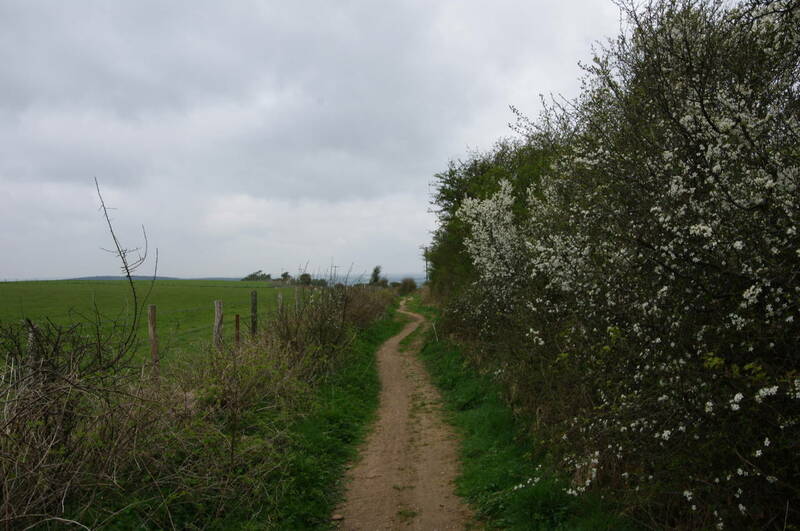 When the road bends to the right the Way continues straight ahead along a farm track to reach Lomer Farm, where the route of the South Downs Way coincides with that of the Wayfarers Walk, which runs from Inkpen Beacon to Emsworth. 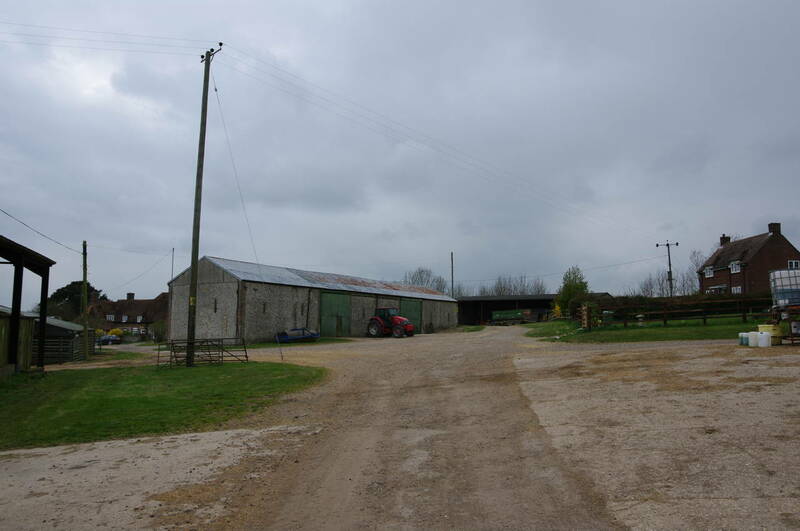 The route runs right through the middle of the farm buildings (picture 27), before continuing along the farm track beside fields for another kilometre to Wind Farm (nothing to do with alternative energy). 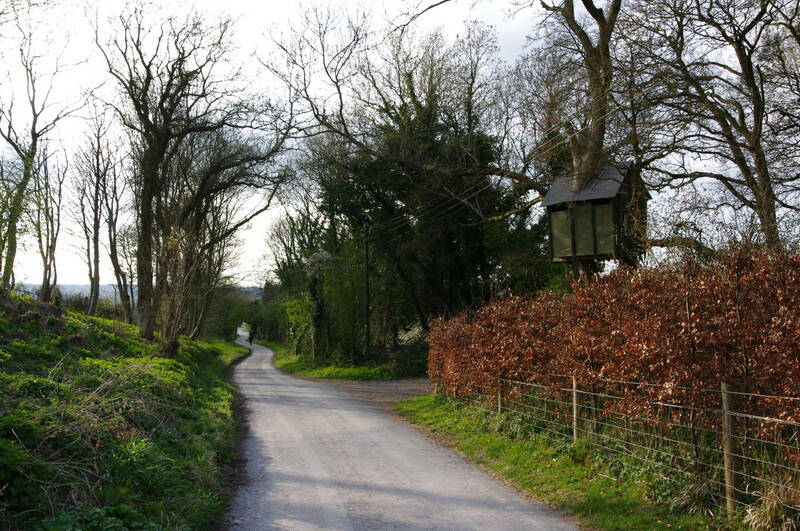 The route bears right just beyond the farmhouse and crosses a road. 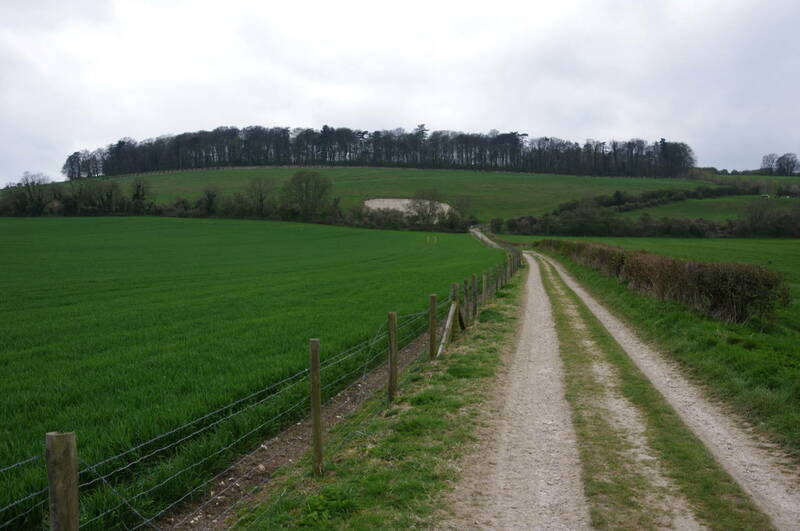 Here the Wayfarers Walk heads off downhill into fields, while the South Downs Way turns left along a worn footpath parallel to the road on Millbarrow Down (picture 28). 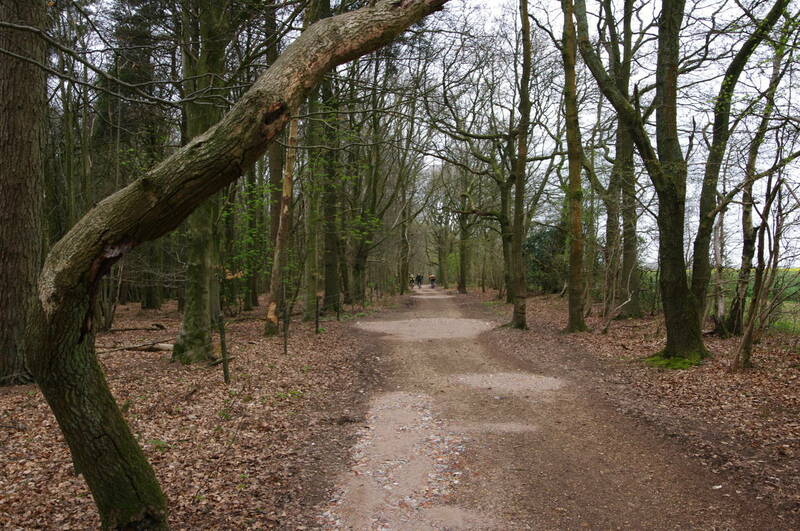 When the woods end, the path rejoins the road for a few minutes walk up to a pub called The Milburys (picture 29). 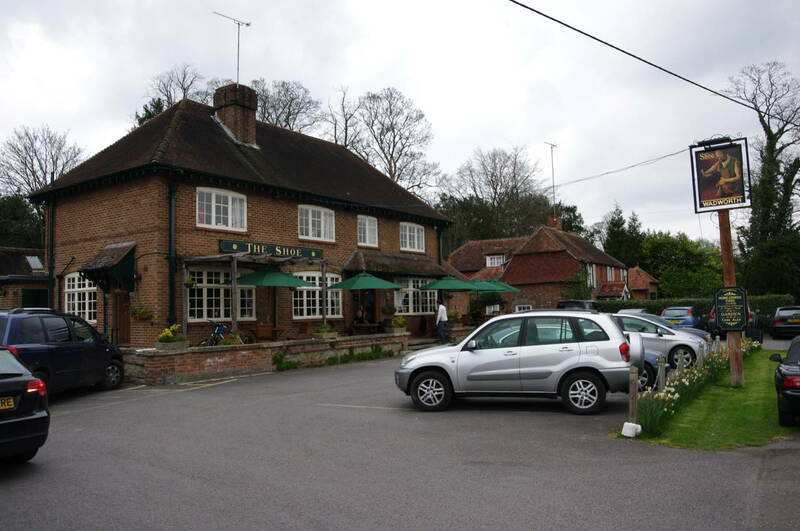 The route turns right along a road beside the pub and then left again after a hundred metres onto a track known as Holden Lane. 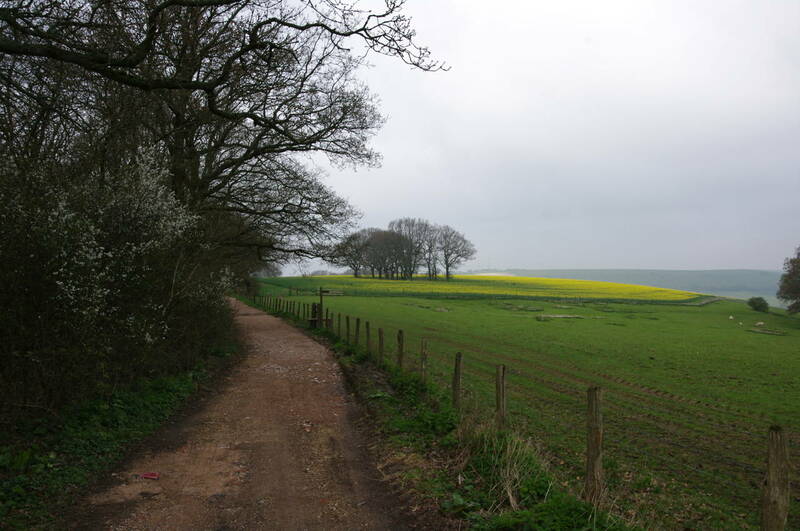 The lane heads slightly west of north through farmland for the next three kilometres, heading between the stables and buildings of Holden Farm (picture 30) before reaching the A272 road. The Way crosses the road and heads up a farm driveway to a wooden gate, through which the route turns right along the field edge. Reaching a metal gate in the corner of the field the path almost doubles back on itself to follow the next field edge up to another wooden gate. Here the route continues northwest for the next three kilometres on a farm track called King's Way, which runs between fields across the gentle slope of Gander Down. 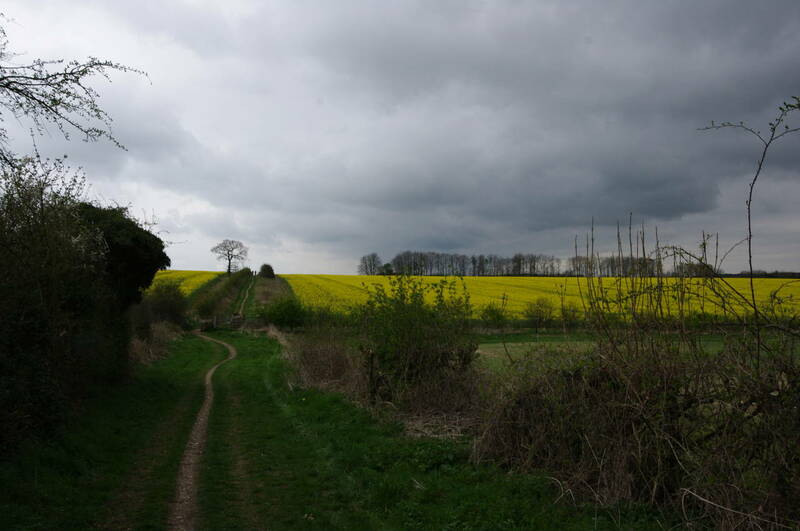 As I walked along this track I noticed dark clouds rolling in from the northeast (picture 31), though these eventually passed over without any rain falling. At an intersection of tracks near the brick and stone Keeper Cottage (picture 32), the Way turns left, heading southwest through a clump of trees and then alongside a field. 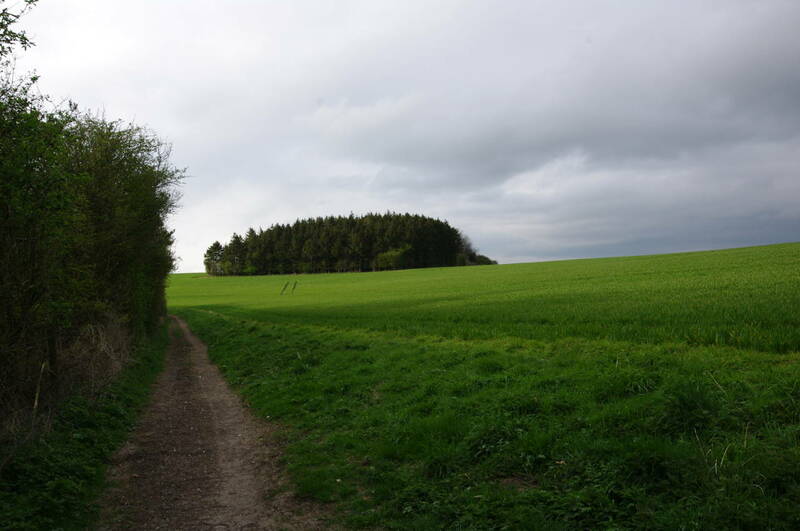 At the end of the field, a fingerpost points the way through a gap between the woods of Long Clump and Great Clump (picture 33) and along the edge of the steep slope of Cheesefoot Head (picture 34). Through a gate and across a grassy field, the path crosses the A272 again and heads over another field before turning right at a signpost. 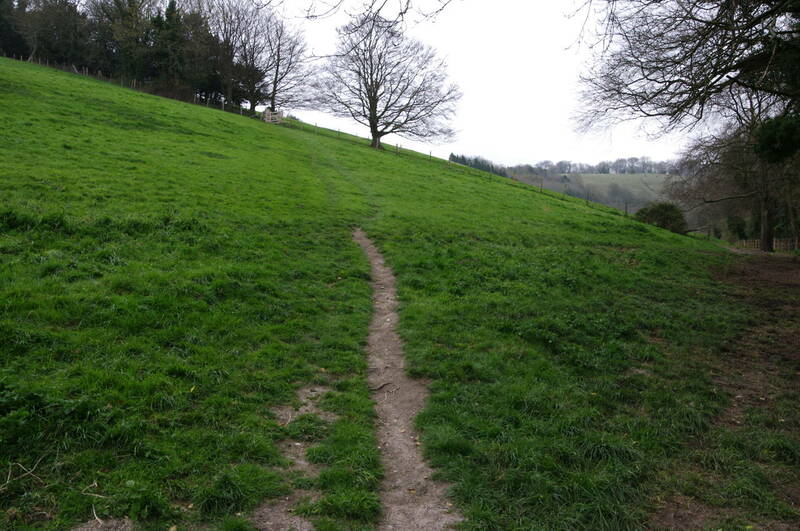 The path very gradually curves to the left as it runs along the edge of a grassy field atop Telegraph Hill, where the sun emerged for the first time in the day (picture 35). 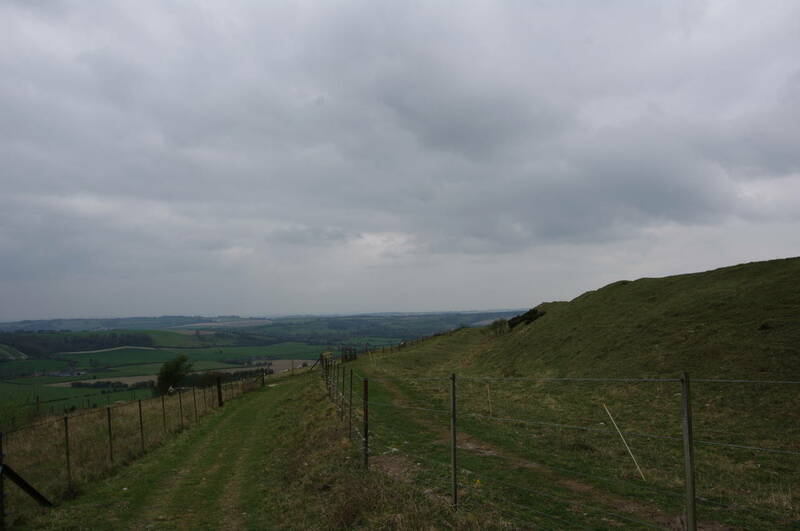 As the path begins to descend, it passes by the grassy hump of a Bronze Age burial mound (picture 36). The path soon joins a farm track leading to the end of a lane by a steep-roofed house. 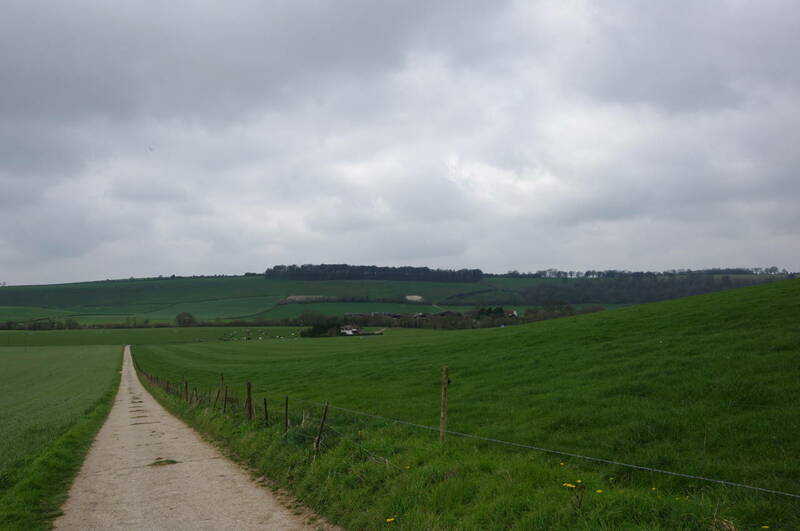 The South Downs Way turns sharply right to head down the lane as it winds its way down towards the village of Chilcomb. Part of the way down the hill I passed by a treehouse (picture 37), the first one I can remember seeing on my walks in England. The lane levels out as it heads through the quiet village (picture 38) and bends around to the right and then again to the left as it leaves the village. At the junction of Chilcomb Lane and Kings Lane, the Way goes diagonally between them, heading along the edge of a field (picture 39) for the next kilometre with the roar of traffic on the M3 motorway growing ever louder. 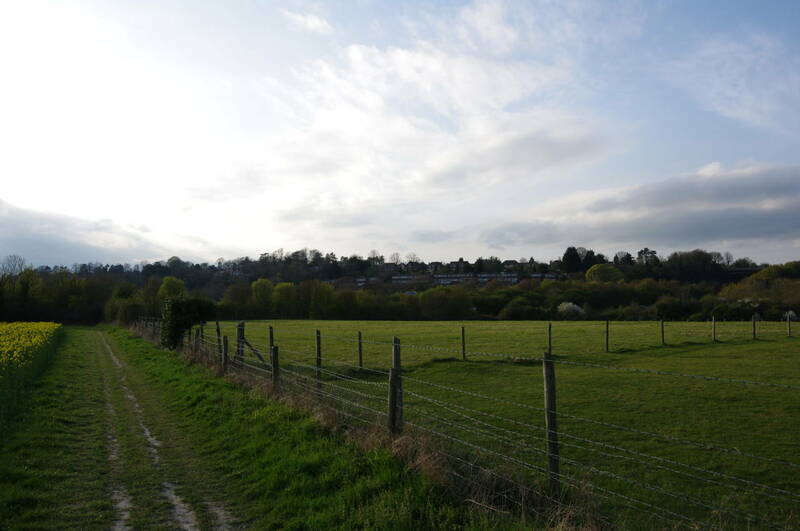 Towards the end of the field, the houses beyond the motorway on the edge of Winchester come into view (picture 40). In the corner of the field the Way follows a footpath to the left and then over a long footbridge above the A3 and M3 roads. The footpath then leads to the right, running parallel to the motorway for a few hundred metres before turning away along a quiet surburban street called Petersfield Road. After almost a kilometre, the road divides and the Way heads down East Hill to turn right onto the busier Chesil Street. 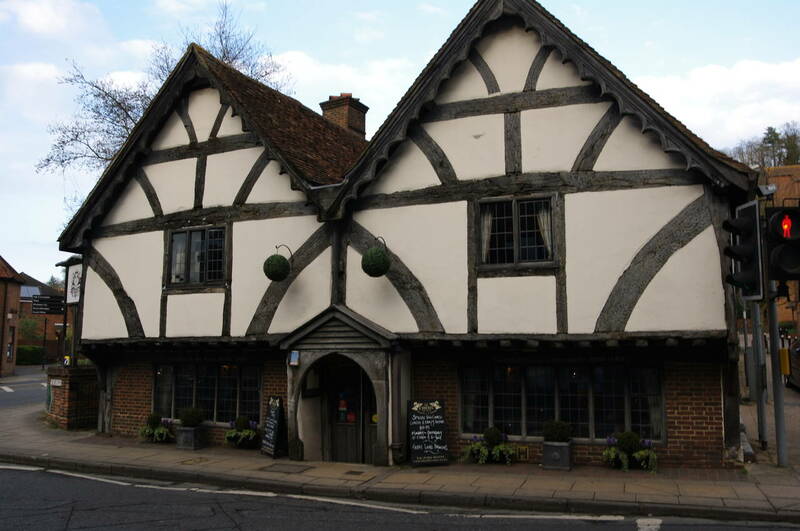 Chesil Street ends at a roundabout beside the timber-framed Chesil Rectory pub (picture 41) and the route turns left into Winchester's High Street and crosses the River Itchen. 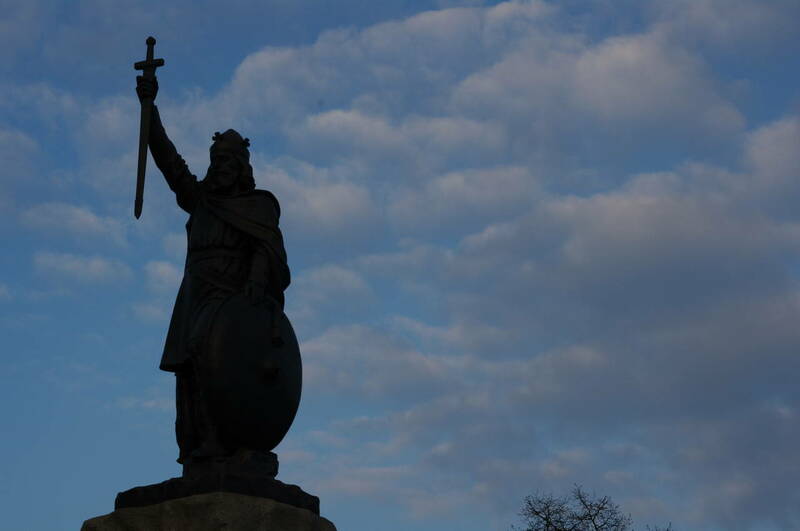 Ahead, the famous statue of King Alfred faces down the High Street (picture 42) and the South Downs Way goes ahead past the Guildhall and through the shopping precinct for a couple of blocks. 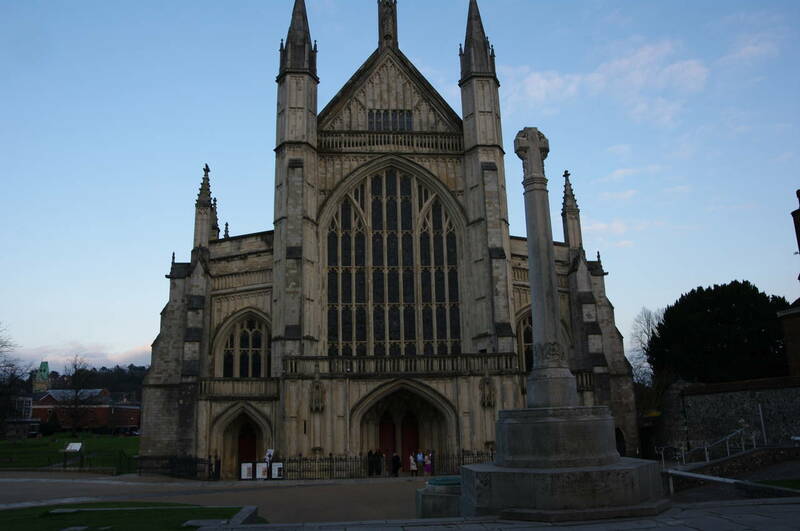 The route makes its final turn to the left into the neat grounds of Winchester Cathedral, and I reached the official end of the National Trail by the front of the magnificent 12th-century building (picture 43). After a short rest on one of the park benches I took the customary self-portrait at the end of the trail (picture 44) and then headed off for the railway station, which lies more than a kilometre's walk to the northwest of the cathedral. 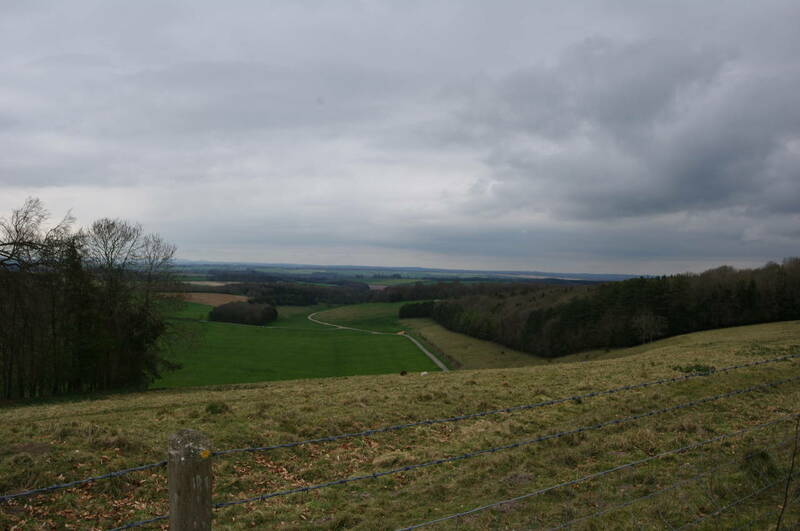 This had been my longest day's walking in England so far, having covered 37 kilometres on the South Downs Way. 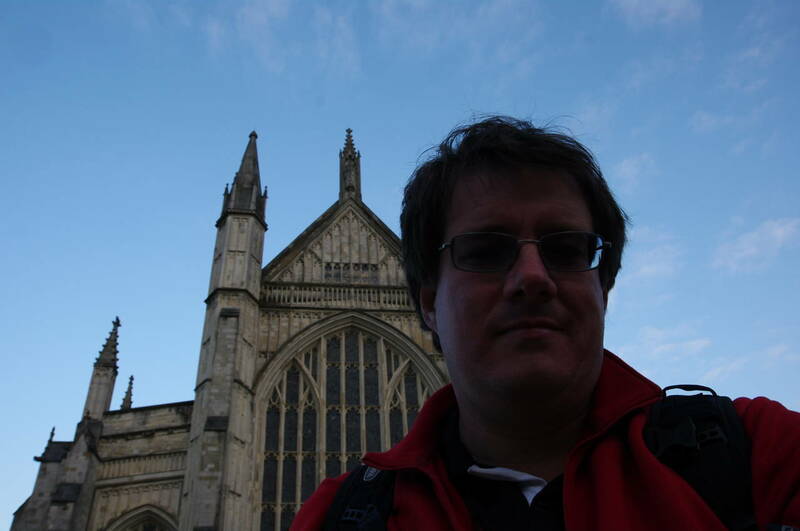 By the time I had walked up to Winchester Station it was getting quite dark. My GPS showed a total of 42 kilometres walked for the day -- a marathon effort, you might say.